Over the years we've been receiving album promos, I've noticed that the majority of the promos that we get from the Southeastern Asia region tend to use the use the words "brutal", "extreme", and "grind" in the band's description. 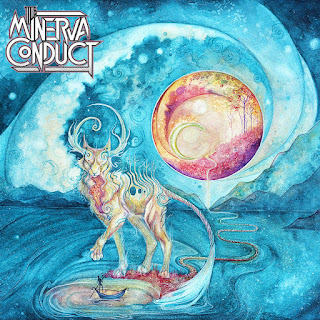 "Instrumental" and "atmospheric" are terms that are a rarity, so coming across the debut of India's The Minerva Conduct was a real treat. Comprised of members of other Indian extreme metal bands, The Minerva Conduct is also aided in the drumming department by ex-Animals As Leaders member Navine Koperweis. While the self-titled debut of this collective doesn't necessarily bring anything new to the table, it does pool together familiar elements in an impressively balanced manner. Technicality, rhythmic hooks, heaviness, and ambiance are things that not all instrumental act tries to equate in their band's formula, but The Minerva Conduct does exactly this, making it more than a worthwhile listen. What you're in for as a listener is apparent right off the bat with the album's opener, "Vile". Kicking into a heavy thicket of guitar riffage, the track also utilizes varied tempo changes and synthesizers to layer the background; further accentuating the heavier breakdowns and melodies. Over the course of the rest of the album, no riff or melody ever overstays its welcome as they are steadfast in moving fluidly into the next section. This cultivates a listening experience that is as captivating as it is forceful. Speaking of force, the guitars pack a wallop on this album. Knee-jerk reactions would smack of the djent label on their approach, but that would be cutting the performance short. There are traces of that style in many riffs throughout the album - "Desertion" and "Metanoia" being prime examples - but it never comes across that they rest their laurels on that solely. Even guitar solos, which are usually in abundance with instrumental work, are hard to come by here. Like everything else that comprises The Minerva Conduct's sound, solos are sprinkled in more for flavor rather than for show. With this self-titled album, The Minerva Conduct have made a staggering debut. By keeping multiple elements balanced, The Minerva Conduct manages to output something that's progressive but simultaneously accessible. It features some fun guitar solos and synth-laden soundscapes but also has an incredible sense of groove and melody. It can machine-gun fire out breakdowns and guitar riffs but can also slow things down to build tension. Also, with none of these contributing factors getting lost in the mix, it makes for a great album to play at obnoxiously loud volumes. Consider this album mandatory listening.